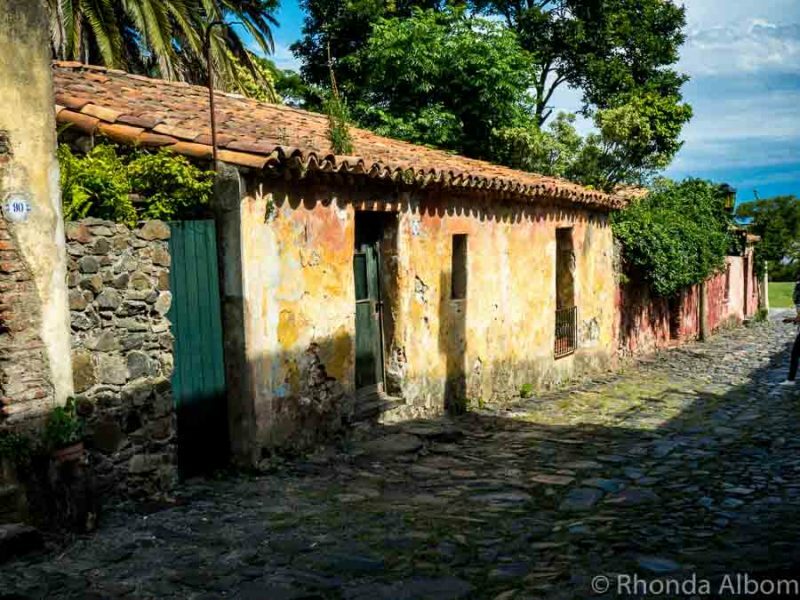 Colonia del Sacramento, or Colonia as the locals call it, is Uruguay’s oldest city. A beachfront town founded by the Portuguese in 1680, it sits across the Río de la Plata from Buenos Aires, Argentina. Colonia’s distinctive character is defined by winding cobblestone roads and the colourful architecture of its historic old town. However, there is more to this city than just the historic district. Situated at the convergence of the Parana and Uruguay rivers on the Río de la Plata estuary, Colonia was frequently invaded, changing between Portuguese and Spanish hands seven times before becoming Uruguay. 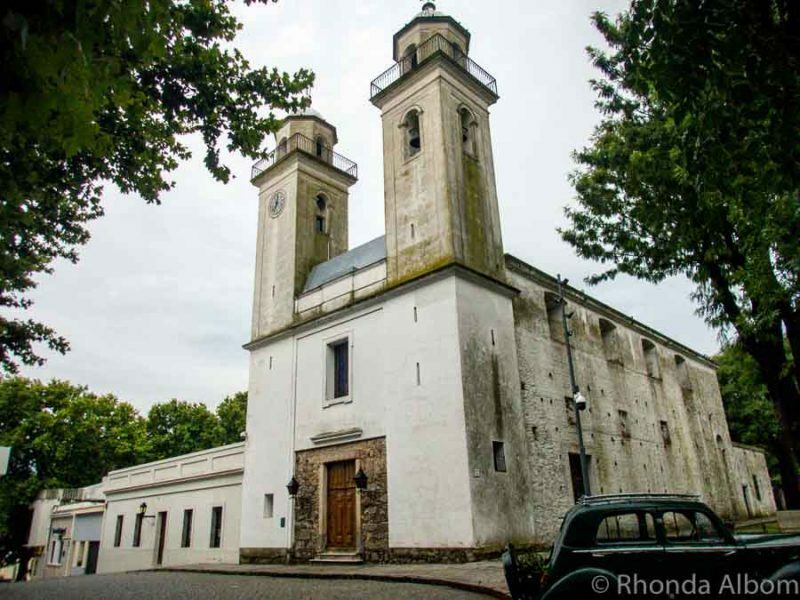 Colonia makes for an interesting and long day trip from Buenos Aires. As we emerged from the ferry and cleared customs, we had one question in the back of our minds; should we have hired a guide? Armed with a teen who is fluent in Spanish, we opted to be on our own. And to be honest, it was easy. There is one road leading from the ferry terminal to the walled historic quarter, a UNESCO World Heritage site since 1995. Keeping the sea to our left, we strolled to the old city in under 10 minutes. If you prefer a guided adventure, this small group tour starts in Buenos Aires. Simplifying the travel process, your guide will pick you up at your hotel and you will travel together to the ferry terminal, across the river, and then to the old town. Here, you will learn about history and culture during a guided two-hour walking tour of the enchanting historic district. Next, you will have three hours to explore on your own. Finally, a ferry back, and 12 hours after you departed you will return to your hotel. Before you sign up for any tour, we encourage you to read the tour reviews. While our recommended tour has a limited number of reviews, Signaturetours, the company behind it, has excellent reviews for their Argentina and Uruguay tours. The wooden draw bridge and city wall were rebuilt in the 1960’s, although passing through into the historic quarter still feels like a time warp. A row of bronze nails in the wall marks the height of the ruins before renovations began. 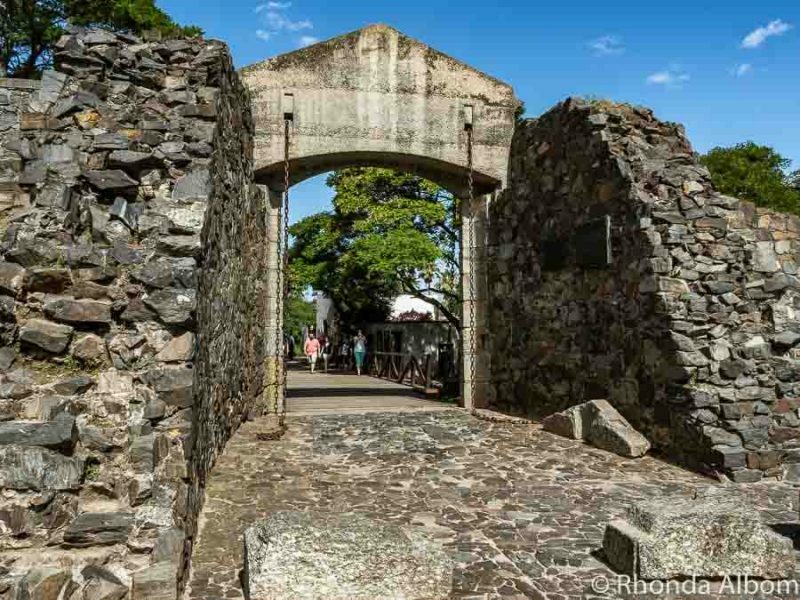 The drawbridge leads to the city gate and into the historic quarter of Colonia del Sacramento. 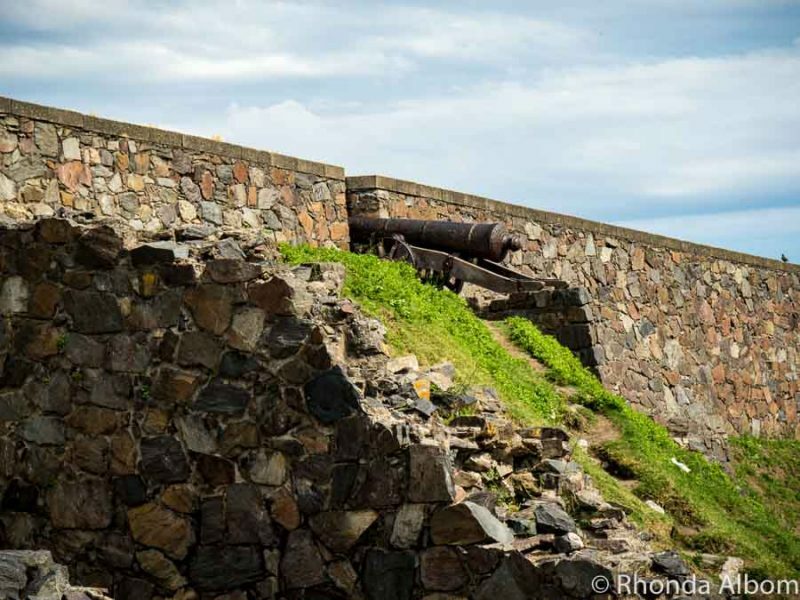 Original cannons that once protected Colonia line the city wall. Quaint and colourful, the 16th-century houses stand shoulder to shoulder along the original cobblestone road named Calle de los Suspriros. They represent a mix of Portuguese and Spanish styles. Houses along Calle de los Suspriros. Turned on in 1857, the lighthouse is still operational today. It was built on the ruins of the Saint Francis Convent, which had been destroyed by fire in 1704. We didn’t climb the 111 stairs to the top of the lighthouse, although we have talked to many people who say the view is worth the nominal entrance fee and the effort. 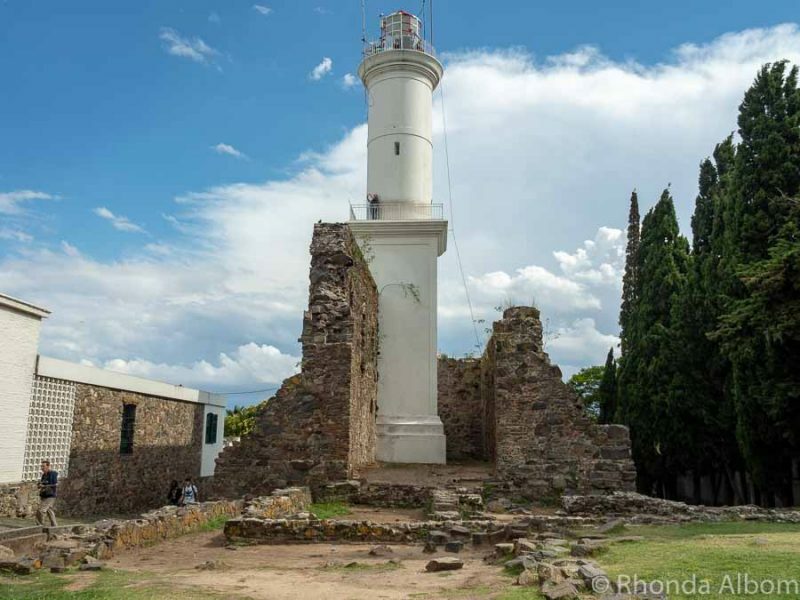 If I were to go back again, this would be on my list of things to do in Colonia del Sacramento. Lighthouse built on the ruins of Convent de San Francisco. Normally, Bastión de San Pedro is a spot to swim during the day, fish off the nearby rocks, or relax and wait for a stunning sunset. Not so for us. A storm was brewing and we could see it coming. As the wind picked up, we knew it was going to be bad, but the locals didn’t seem to be phased by it. That is until the first flash of lightning cracked in the sky. Suddenly, locals bolted off, except for a few determined fishermen. We looked out towards the sea and decided to follow the crowds. Fishermen on Bastión del San Pedro just before a storm reached the shore. If any of the town’s eight museums are on your radar, the Municipal Museum should be your first stop. Here you can purchase a daily museum pass for $50 UYU ($1.50 USD or $2.20 NZD) that gets you into most of Colonia’s museums, however, they are not all open on the same days. Most of the museums close by 4.30 pm. Top row: The Tile Museum exterior and interior. 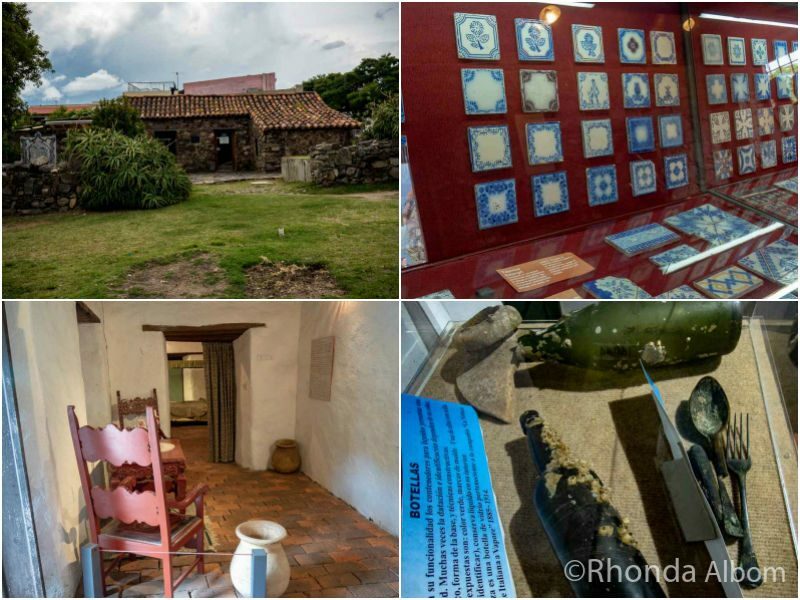 Bottom Row: Casa de Nacarello (original Portuguese furniture from this 18th-century home that is now a museum) and items recovered from a shipwreck in the Navel Museum (not on the museum pass). 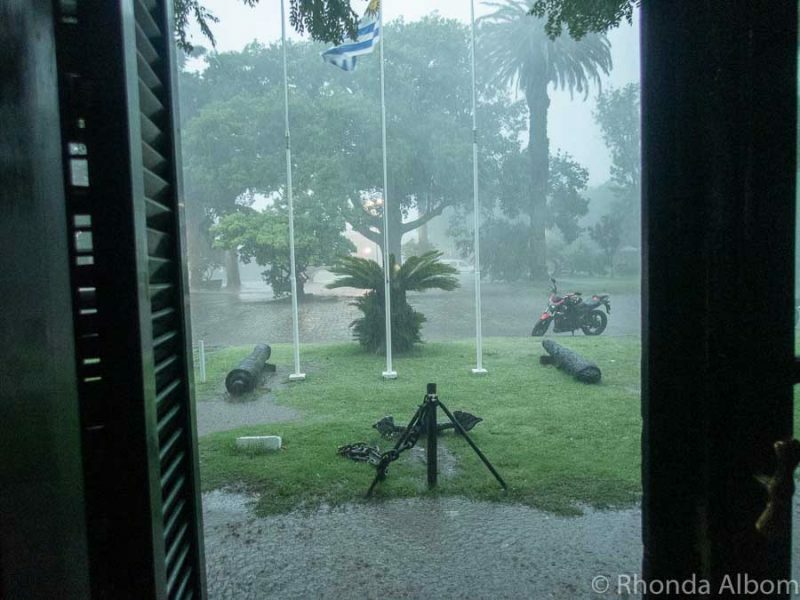 Luckily, when the sky dumped buckets the Naval Museum took pity on us and allowed us shelter even after they closed. The winds were so strong that all ferry services were cancelled. And then, as suddenly as it had started, it stopped. No more rain, no more wind, ferry services resumed. Looking out the front door of the Navel Museum during the storm. The basilica was built of stone and brick by the Portuguese in 1808 and maintains its original design of a single nave. Basilica del Santisimo is the main cathedral in Colonia del Sacramento. In 1680, Casa de los Gobernadores was the most prestigious house in the city, with a watchtower to keep a lookout for invaders. It was built for Portuguese Captain Manuel Lobo, who founded Colonia and was governor of Rio de Janeiro. Ruins of Casa de los Gobernadores, a bit flooded from the storm. Mercosur is where the locals go for a casual dinner. It’s a 5-6 block walk from the old town (located at Av. Gral. Flores 252). 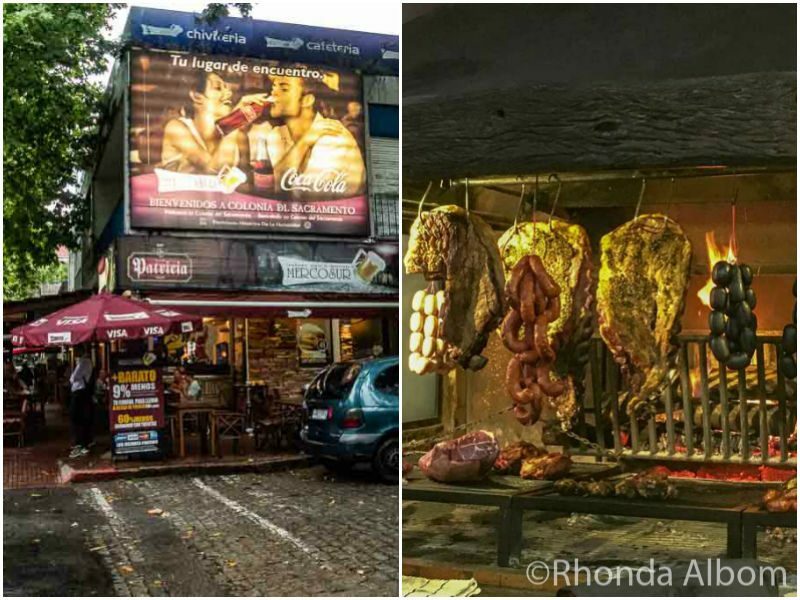 I couldn’t resist the parrilla (slow cooked meats like asado in Argentina). We enjoyed a parrilla (slow barbequed meat) dinner at Mercosur in the more modern section of town. If you are planning a day trip from Buenos Aires to Colonia, the ferry is the way to go. Three companies offer similar transit. 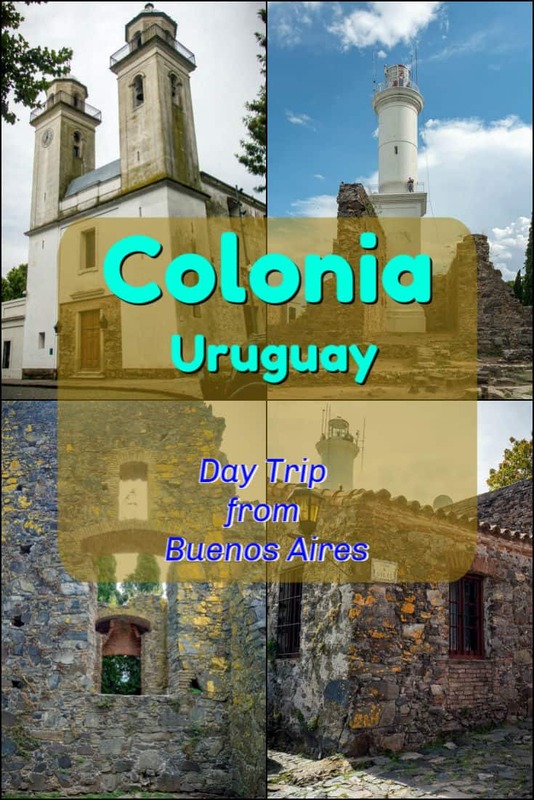 We took Colonia Express to Uruguay and Buquebus back to Argentina at the end of the day. 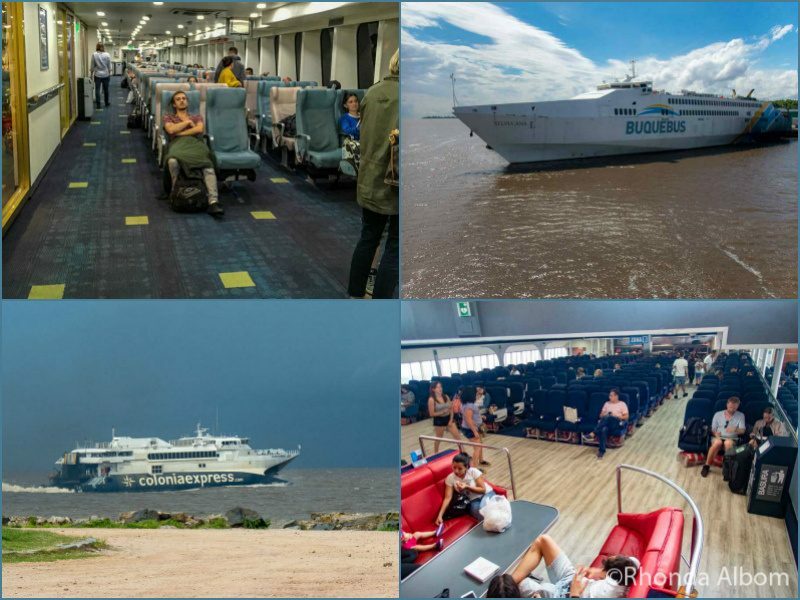 In many ways, the service is comparable, but we found the Buquebus ferry to be more comfortable than the Colonia Express Uruguay ferry. If you are doing a day trip from Buenos Aires to Colonia, take the early morning ferry to allow yourself time to visit the museums. Arrive at the ferry terminal about an hour in advance, as you need to clear immigration and customs. It is a quick process once you get to the front of the queue. Right after you are stamped out of Argentina, you move to another queue and are stamped into Uruguay. Buqebus and Seacat leave from the North Dársena terminal, while the Colonia Express terminal is at the southern end of the Rio Dique although still in Puerto Medero neighbourhood. We stayed in Recoleta, much closer to the Buqebus terminal. Learn from our mistake. If you are doing it on your own, study the map before you head out or use your phone’s GPS, as our taxi driver took us a very long way to the southern terminal. Prices and sailing times are comparable between the competitors, with prices increasing based on demand (similar to airlines). Booking early is a good idea. Buquebus was sold out on our travel day. You can book online at Buquebus or Colonia Express. Once onboard, seats are not assigned. On Buqebus, those along the back wall go quickly, as regular riders know this is where they will find an electrical outlet. Both ferries we took offer an overpriced snack shop featuring ham sandwiches, beverages, and sweets. Onboard duty-free shopping is quite popular amongst the locals, who stock up. The shops are open only when the boat is away from port. Currency is the Uruguyuan peso, however, everywhere we went in Colonia displayed three prices: Uruguayan pesos, Argentinean pesos, and US dollars. And if you pay with a foreign credit card, you can often get a VAT tax (22%) refund. PRO TIP: This discount should be automatically applied at restaurants, car rentals, and hotels if paying with a foreign card. See more at the official government site. If you return to Buenos Aires on Buquebus or Seacat, the taxis at the port charge very high prices. Specifically, they wanted $450 ARS to take us to our nearby hotel. Instead, we followed a large crowd out the door, walked a few blocks, and then hailed a taxi. We paid the metered amount of $101 ARS. However, I would not have felt safe walking just outside of the Colonia Express Argentina terminal in the dark. We hit the big three of Uruguay, each as independent visits. Colonia del Sacramento (this page). 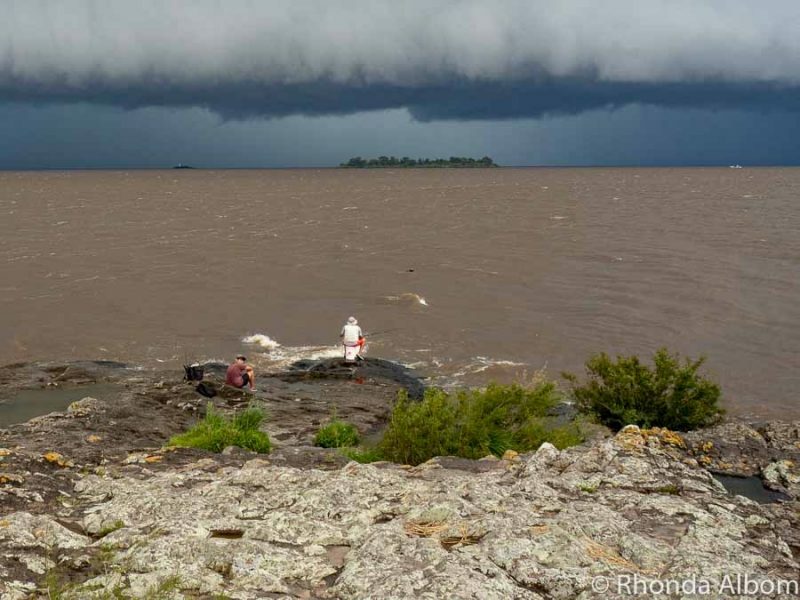 Will you take a day trip from Buenos Aires to Colonia del Sacramento? Wow! What a storm. I’m glad that you were allowed to get in out of it. The place looks very interesting in this area Rhonda. See ya. Great pictures! Looks like it was a good trip. Wow look at all of this historical beauty. So vintage feels like you are in another era. Looks like a great place to explore, minus the rain. I just discovered Chili and these incredible mountains in patagonia. They are so on my bucket list. Have a great weekend. 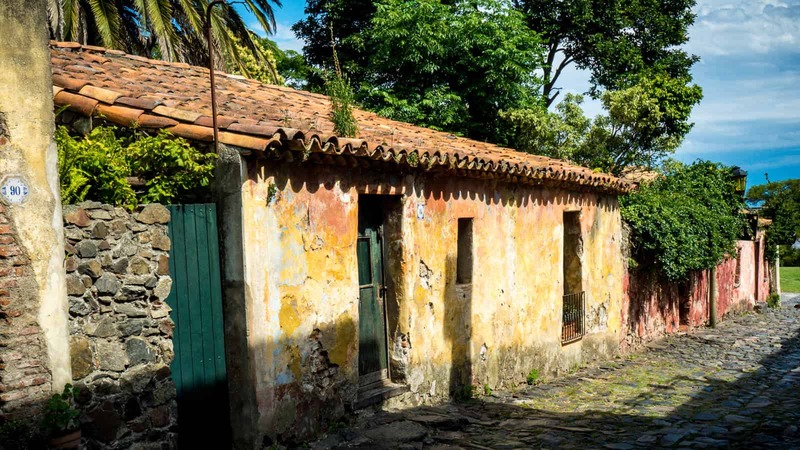 I can’t imagine why you would need to hire a guide to see Colonia – it is such an easy, compact place, although you seem to have discovered this quite quickly. David and I spent a few days there – we hired a car at the ferry terminal and had no trouble driving outside the old town area. It allowed us to see sights further out like the old bull-ring. One tip for the Buquebus Ferry is to pay for Especiale Classe – it is very little more and a first class world of its own. You might want to dress up a bit though – we felt like the Beverley Hillbillies in our usual tourist shorts and shirts. Beautiful land! I can only imagine the history that is here!! Wow what a trip! I loved all the photos you took, it looks so beautiful. This is so beautiful! Thank you for sharing and letting me see the pics! Buenos Aires is definitely somewhere I’d love to travel to see, so thank you for a lovely armchair introduction. History, beauty, old buildings – there’s much for a traveller to discover. We visited a few places in South America on a world cruise, and in particular I loved Cartagena. But Argentina is a whole different story. My nephew imports wine from Uruguay. I would love to visit in South America after hearing about it from him and you. Colonia sounds a really awesome place to visit. Good to hear that the rain stopped and you were safe. Thanks for this trivia and helpful tips. This is the kind of day trip that I really really like. What an incredible city to visit and tour through. I’ve never been but it’s so nice to have virtual tours . Thanks for sharing! I love that really colorful building. All the shots are wonderful! Even the food – yum yum! I’m totally into the history and stories of the places I visit! I’d love to take a day trip from Buenos Aires to Colonia del Sacramento and immerse myself in the experiences. 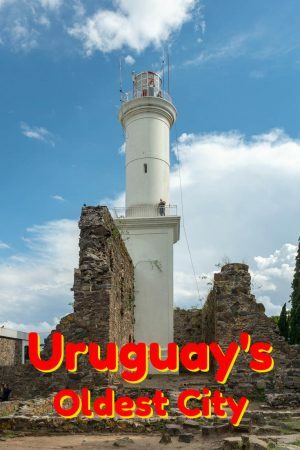 I’ve not yet been to Uruguay, but it’s on my list! Thx for this great virtual tour of Colonia. What a wonderful place to explore. I love all things old and to learn about their way of life. Wow, that was some rainstorm. Reminded me of some of the rains we had in the Caribbean. This looks like it would be such an amazing experience. I bet that there is nothing like it to be able to discover new things. Haha,hats off to that fisherman! So brave 😀. Absolutely enjoyed reading this post and what a beautiful place 😍 I would love to visit this place. Very interesting series. The lighthouse rising from the ruins is completely unique and striking to see. 111 steps sound rather strenuous my old knees and lungs! Wonderful..Glad you shared this amazing list. I am a travel bug and looking forward to experiencing Buenos Aires later this year this list will help me out. 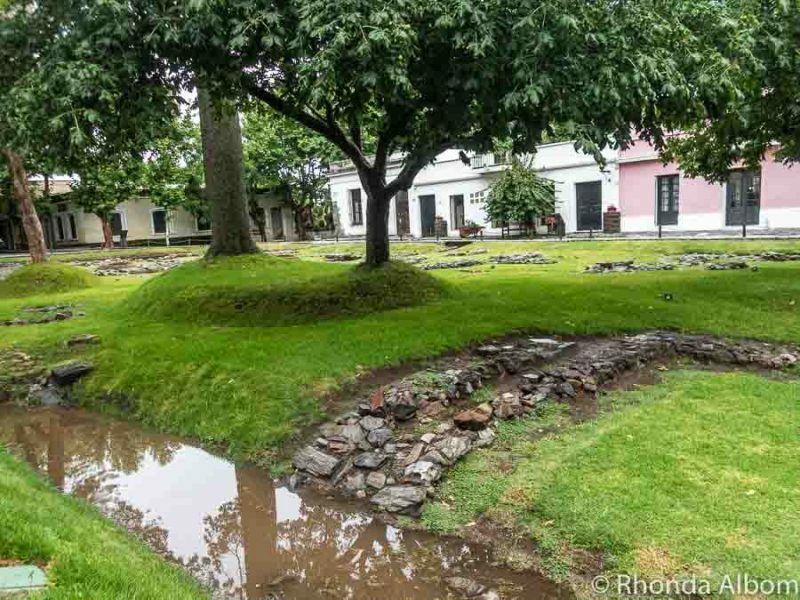 I absolutely loved Colonia de Sacramento. After being stuck in Buenos Aires for almost a month (because of the volcanic eruption in Chile) we were desperately looking for some day trips outside the city. This is how we came across this cute little town in Uruguay. I didn’t expect to like it so much. I remember having a wonderful dinner there. There are quite a few nice restaurants in Colonia de Sacramento and for sure many photo opportunities. Very colorful place!